All too often the drummer is hidden back of stage behind the brass and the reeds, yet he carries the entire band with his beat. 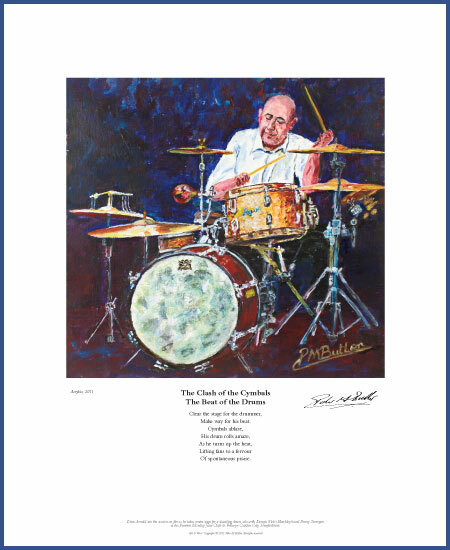 So when the Fenny Stompers opened ranks to give Dave Arnold centre stage I seized the opportunity to capture just the image I needed for my jazz painting of him in one of his full power drum solos. This is reflected in my Dave Arnold Jazz Portrait poem. 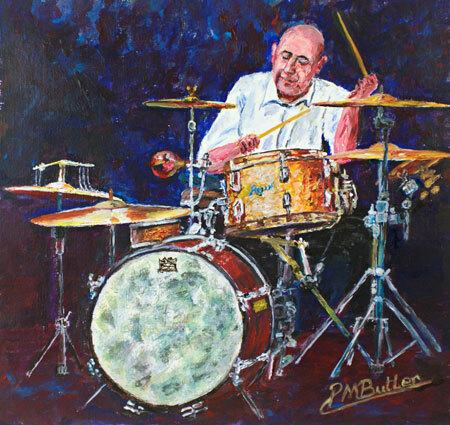 Jazz portrait of Dave Arnold setting the session on fire as he takes centre stage for a dazzling drum solo with Dennis Vick’s Bletchley based Fenny Stompers at the Peartree Monday Jazz Club in Welwyn Garden City, Hertfordshire. Make way for his beat.